As part of the upcoming Blackboard upgrade there are some changes to tools used for assessment and marking that are worth highlighting. Based on data which is being collected by Faculty teams this summer, we will try to create as many summative assessment items in your Blackboard site as we can, including reassessments. This means we will be able to set up the Grade Centre for most modules without staff having to do the work required (be sure to provide the data needed!). The automatic setup based on data should take place in early September, and we advise you not to set up anything like assignments or Grade Centre columns before then. Note that we are currently not able to automatically set up TurnItIn Assignments, PebblePad links, formative assessment tasks or Blackboard tests, blogs and wikis. After assignments are set up you will need to edit them to include specific instructions based on your assessment tasks but the due dates and other settings should be set up correctly already. A new tool called Offline Assignment will be able to be added to Blackboard sites. This tool is designed to create a Grade Centre column which can be receipted when students submit work physically or do a performance for their assessment (e.g. viva, presentation). When using this tool students will not be able to submit their work online, and a staff member will need to mark that the work has been received. At this point the student will receive an email receipt, just like when they submit their work online. Note that lecturers do not have to use this tool for performance assessments: a standard Grade Centre column could also be used to provide marks and feedback, though this will not issue receipts. Based on the assessment data stored in SITS that academics provide their faculties, we hope to set up the vast majority of Offline Assignments automatically in September. However this tool will be available so Offline Assignments can be set up manually where needed as well, which may also include formative and other uses. This tool was piloted in semester two and after the upgrade will be available by default for adding to content areas. Advanced Assignments Tool – Last year we introduced a tool for uploading marks and feedback to the Grade Centre in bulk, previously known as the Batch Upload or Bulk Upload tool. It is being renamed the Advanced Assignments Tool. It also is useful for those wanting to upload student files in bulk to TurnItIn, where the students have not uploaded their file to TurnItIn themselves. It will be available by default in the Control Panel after the upgrade with the name Advanced Assignments Tool. Blackboard have also fixed the Peer and Self Assessment tool which now means it should be usable with students again. This tool is off by default in Blackboard sites and needs to be enabled if you wish to use it. The tool can be useful if you are looking to facilitate peer review of assessments so students gain a better understanding of assessment criteria and assessment work. 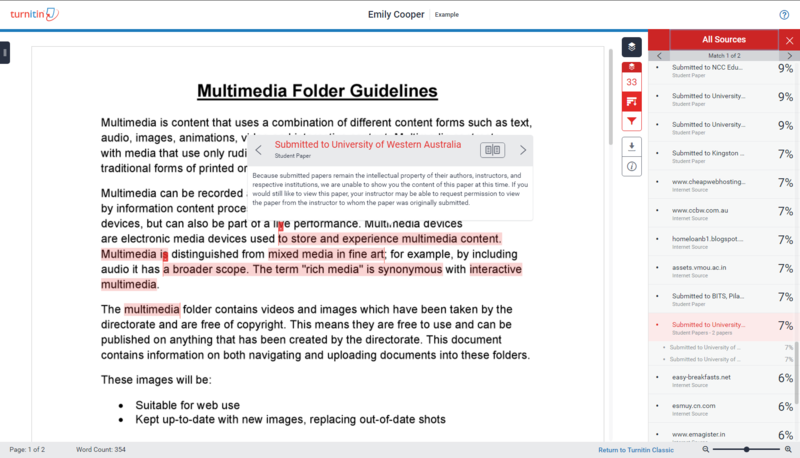 TurnItIn originality reports will also have a different look and feel, though functionally they will be similar.